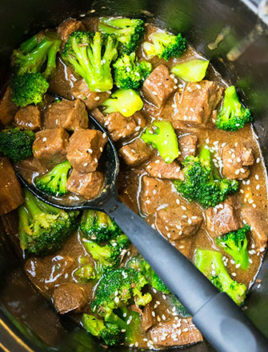 Quick and easy slow cooker beef and broccoli recipe, made with simple ingredients. The juicy, tender beef is coated in soy ginger garlic sauce. If you like my One Pot Chicken and Broccoli Recipe, you are going to love this slow cooker beef and broccoli recipe. The beef is so soft and tender and the sauce is so juicy and flavorful that you would have this on your meal plan every week. I wouldn’t call this recipe authentic because it has been modified to suit the American taste but it’s still so delicious. I think this is even fresher and better than Chinese takeout. Also, you can modify it to suit your preference. Plus, it’s so much cheaper than takeout and not as greasy either. This slow cooker broccoli beef requires only 10 minutes of prep time! You just dump all the ingredients and let it all cook for a few hours. Truly can’t get easier than that! How to make beef and broccoli? 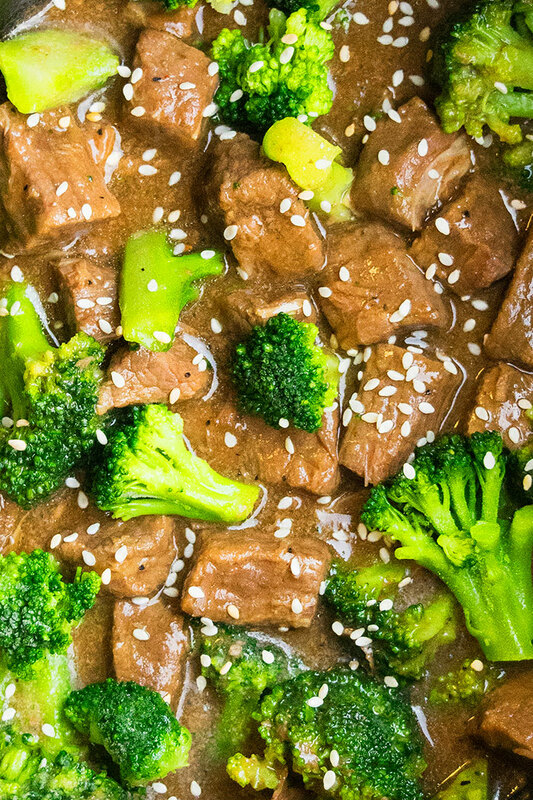 How do you make easy Chinese beef and broccoli? Add the beef, soy sauce, brown sugar, broth, sesame oil, pepper, ginger, garlic, Sriracha sauce in the slow cooker and mix it all together. Remove some of the sauce into a small mixing bowl and mix it together with cornstarch. Pour this mixture into the crockpot and mix everything together. Cover and cook for a few more minutes until sauce thickens. Garnish with sesame seeds and enjoy. What meat is used for beef broccoli recipe? Flank or sirloin beef are best. Cut across the grain. 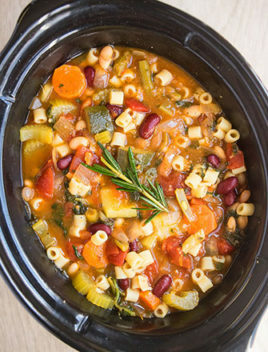 Since there are so many different brands of crockpots, cooking time can vary slightly. I have noticed that those with sealed covers usually cook a little faster since less heat is being let out (About 20 minutes quicker). For the recipe below, I used a crockpot without the sealed cover. This version is more suitable if you are cooking over the stovetop in a wok. Add the ingredients from the recipe below in a wok and cook it on high heat until the sauce thickens and fully coats the meat. To make this healthier, use honey or molasses instead of brown sugar. Mix in 1-2 cups boiled ramen noodles and more broth (per your desired consistency) at the end to make a very filling meal. Use low sodium broth and low sodium soy sauce to prevent this meal from becoming too salty. Do not add the broccoli in the beginning because it It will become very soft and soggy by the end. Add it towards the end. For firm and crunchy broccoli, add it in the final l 15 minutes and let it cook. For soft but firm broccoli, add it in the last 30 minutes and let it cook. Cooking time may vary a bit, depending on the type of slow cooker you use. Adjust the amount of sugar and soy sauce, based on your preference. The sauce will thicken a bit more as it cools down. 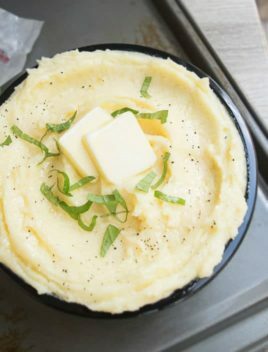 Some people just dump the cornstarch in the crockpot but I don’t recommend that because doing this can form little starch lumps. I recommend dissolving cornstarch in some of the sauce separately and then mixing that into the crockpot. Don’t replace brown sugar with granulated sugar because brown sugar has a deeper, richer flavor. Don’t omit sesame oil because even though it’s a small quantity, it adds an immensely strong aroma and flavor. Use other frozen vegetables, if you like. 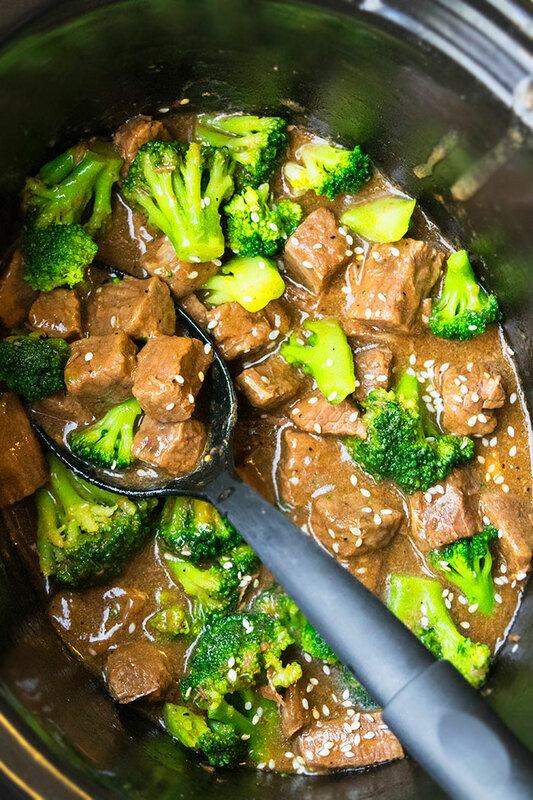 Quick and easy beef and broccoli recipe, made with simple ingredients in slow cooker/ crockpot. Juicy, tender beef is coated in soy ginger garlic sauce. Cover and let everything cook for 3 hours on high OR 5 hours on low. 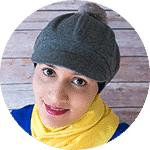 Remove ⅓ cup of the liquid into a small mixing bowl. Add cornstarch and mix it together until smooth. 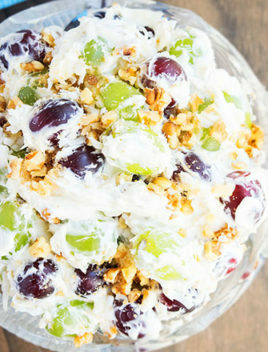 Pour this mixture in the crockpot and mix everything together. This is so delicious! Leftovers are even better. 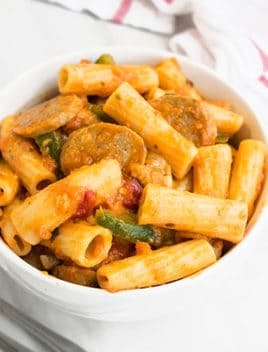 One of our favorite meals for takeout, and now it’s our favorite slow cooker dish!